Xiaomi has seen monumental success with its Redmi Note 4. This budget smartphone has managed to become the most selling smartphone in India. These sales figures have propelled Xiaomi as the second largest smartphone maker in India and the company is hungry for more. A new smartphone from the Chinese electronics giant has made its way to TENAA which is the Chinese Telecommunications authority. 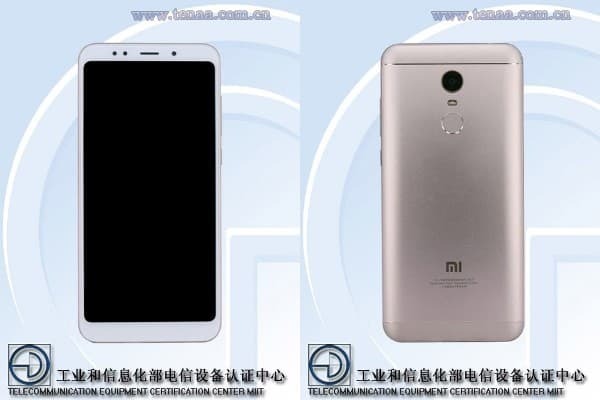 The alleged device bears a striking resemblance to the Redmi Note 4 and that has prompted the media to predict that the new smartphone could be the Xiaomi Redmi Note 5. The biggest change here as you can see from the images above is the presence of an 18:9 aspect ratio display. Yes, 18:9 the aspect ratio of choice for bezel less displays. Sadly the alleged Redmi Note 5 does have bezels but they are much smaller than the Redmi Note 4. When it comes to the technical specifications of the display, the TENAA listing has led us to believe that this alleged Redmi Note 5 has a 5.99inch Full HD+ resolution display with 2160 x 1080 pixels. While it was rumoured that the next iteration of the Redmi Note could have a dual camera setup just like the Mi A1, the purported images say otherwise. We are getting the same single lens, dual flash setup with a fingerprint sensor underneath. The camera spec sheet tells us that the rear sensor has a resolution of 12MP and the front one has a 5MP maximum resolution. The listing on TENAA also tells us that the Redmi Note 5 will be sold in 3GB RAM, 32GB internal memory and 4GB RAM, 64GB internal memory variants. The current Redmi Note 4 was being sold in 2GB RAM, 32GB variant which has been dropped for good. Sadly, the company has stuck with the hybrid SIM setup where you are forced to choose between two SIM or one SIM and one microSD card. The Redmi Note 5 has the same 4000mAh battery like its predecessor. Since we have discussed what we know about the alleged Redmi Note 5, let’s talk about what we do not know. The biggest information missing from the listing is the chipset. Now the Redmi Note 4 had the Snapdragon 625 chipset so we can easily predict that XIaomi must have updated it to Snapdragon 630. We are also unsure about the operating system but based on the Redmi 5A we can easily predict that the Redmi Note 5 will run MIUI 9 which is its take on Android Nougat. Finally we do not know when this smartphone will make it to the market in China and across the globe. Let put an educated guess and set the expected launch date as late as Christmas. I think Samsung takes the crown. They've got the new aspect ratio perfect.